Camp Timber Tops is part of a summer camping organization that began in 1931, one of the oldest continuously owned and operated independent camping organizations in America. The story begins with the founding of Pine Forest Camp, our affiliated coed, full-season summer camp in 1931 by Hughie and Selma Black. In 1961 our "brother" camp, Lake Owego for boys, was started by Hughie and Selma and their children Marvin and Annette Black and Libby and Ted Halpern. 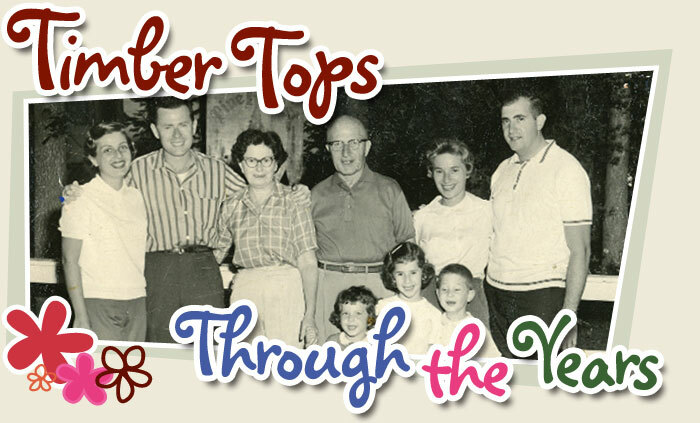 Just two years later, in 1963 the Black-Halpern family opened Camp Timber Tops. Lake Owego and Timber Tops were two of the very first private summer camps east of the Mississippi that were structured so that campers could attend for less than the full summer. Dubbed "The Mountain Camp for Girls," Timber Tops was in its early days a new frontier. Built from scratch on the banks of Lake Selma (named after our founder) and carved into the side of a mountaintop of beautiful pine trees, our first girls summer campers experienced true wilderness camping. That spirit of adventure is still felt throughout camp, though the campsite has become much more developed and, well, comfortable! Nonetheless, Camp Timber Tops has retained an outstanding outdoor camp program. For example, in addition to traditional girls camp activities and athletic events, our Color Days include campsite building, rope burning, and outdoor cooking! In its first seasons, Camp Timber Tops campers swam only in the lake, before modern heated pools were added. A single building housed the dining room, theater and arts center. Campers played on just three tennis courts that also served as the basketball court. Today campers live in modern cabins, play on seven tennis courts, dribble on indoor and outdoor basketball courts, dance in a beautiful dance building, enjoy a large gymnastics complex with professional springboard floor, perform in an outdoor amphitheater and swing through the trees in that original pine grove on an amazing ropes adventure course. They can sleep in the trees too in our tree house in the sky! There’s no better place to stargaze. As Mickey and Barbara Black, Hughie and Selma's grandson and his wife, the current active owners/directors say, the spirit and camaraderie of those first adventurous summers remain the same. Today, daughters of those original pioneers come back summer after summer. They sing the same songs, watch the same sunsets and make the same lasting friendships that only happen at a place like Timber Tops. Moving into the future, Camp Timber Tops will always be an innovator of new ideas to offer the best programming possible for future generations of Timber Tops girls. Reunions are also held at the camp for our Alumni, so come back and visit us!